Who knew that the Sims 4 had the tools to create a very accurate recreation of Booty Bay. 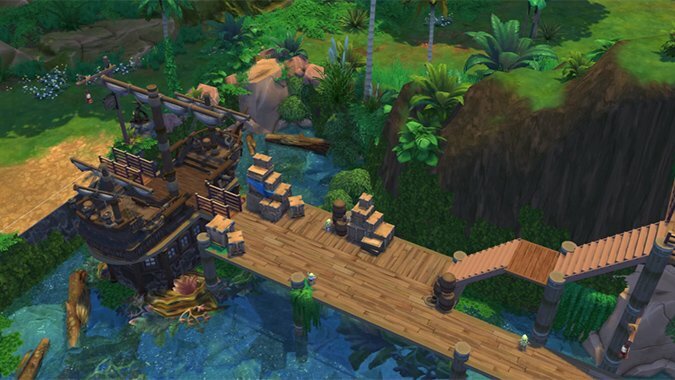 Sims 4 level creator Sati Sim painstakingly placed all of the pieces to create the pirate city. It’s all scaled correctly, down the the furniture in the various wooden rooms. Looking at it, you want to walk through it and relive those memories of questing in the area so long ago — something that’s so unfortunately rare these days. Sati Sim has a 40 minute video that speeds through their entire build. It follows the process of building everything from the Salty Sailor Tavern to all of the water and shore around the outside. It’s impressive how much Sati Sim fit into the build. You’d think it would be much easier to make a portion of the popular area, but instead they went completely all out. Booty Bay doesn’t seem to be a new challenge for Sati Sim. Their YouTube channel has several other builds including: The Darkmoon Faire, Dalaran, and a few other designer houses. The Dalaran build is definitely worth watching because the Sims 4 art style gives it such a unique, simplified look compared to WoW. The best part about all of these builds is that you can download them for yourself and play in them. If I did, I’d walk around and explore all the little specific details that Sati Sim put in. It makes you wonder if Sati Sim does any interior design or architecture stuff outside of this. The amount of skill this takes isn’t nothing and I’d like to see them create something completely unique, be it styled in Warcraft fiction or not. Usually everyone recreates everything in Minecraft. It’s refreshing to see something done in the Sims 4, if only to showcase how much you can do in that game after five years.